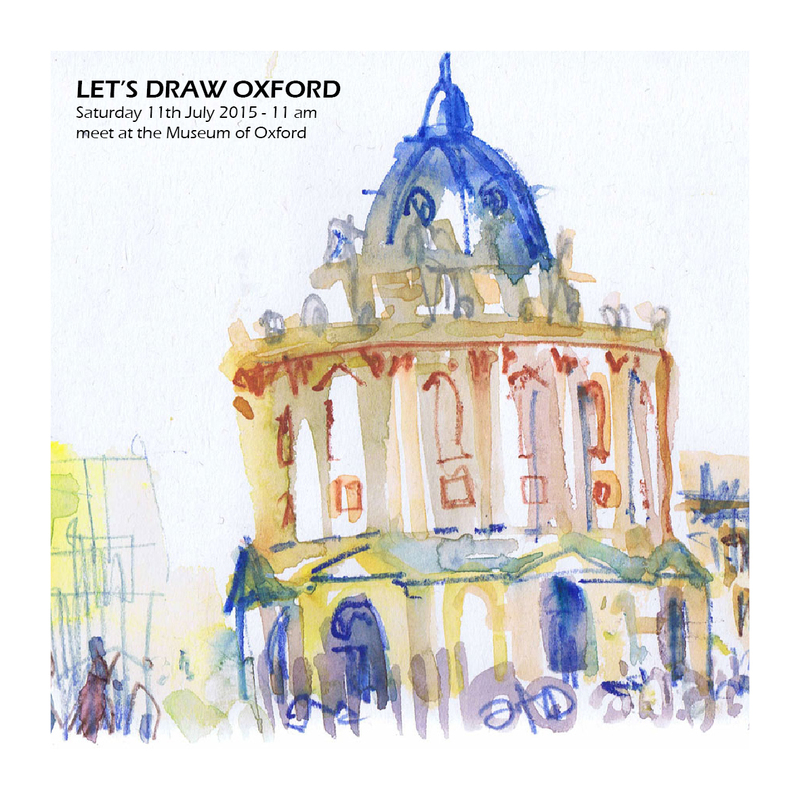 START - 11 am - meet at entrance of the Museum of Oxford with Oxford sketchers and Oxford Workshop participants. LUNCH - 1 to 1:30 m - meet outside St Mary's café in Radcliffe square. END - 3:30 to 4 pm - back at the Museum of Oxford, inside, at the gallery by the Café to share sketches. Oxford workshop exhibition is on show. 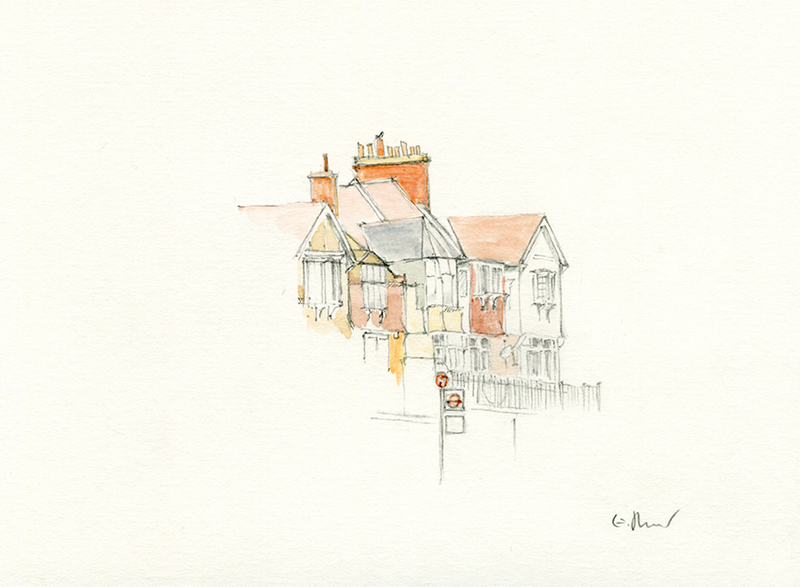 AFTERS - 4:30 onwards - at the Head of River pub for further sharing of sketches, chatting and even some more drawing. TRAVEL - from London there are regular trains and coaches - see the map below with details of stops in Oxford and links to the various websites. MAP - Oxford Sketchcrawl Map Link includes start/lunch/finish/afters/places of interest information. PLACES OF INTEREST - indicated in map with links, include Oxford Covered Market, Christ Church Meadow, High Street and colleges, Radcliffe Square, Sheldonian Theatre, Ashmolean Museum, Natural History and Pitt Rivers Museums and much more. l be there to make this day trip outing the most enjoyable. 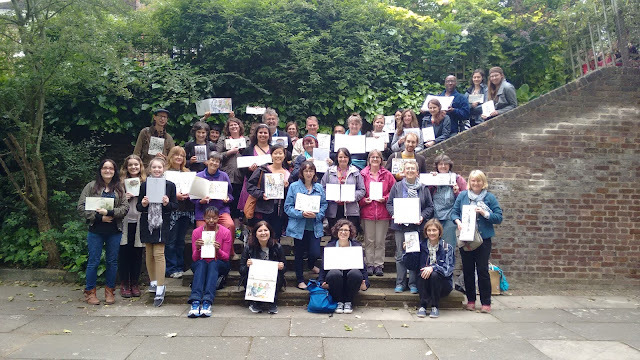 As always, it's free to join, you just need to bring your own sketching materials... and perhaps a hat and sun cream - let's hope it is warm. 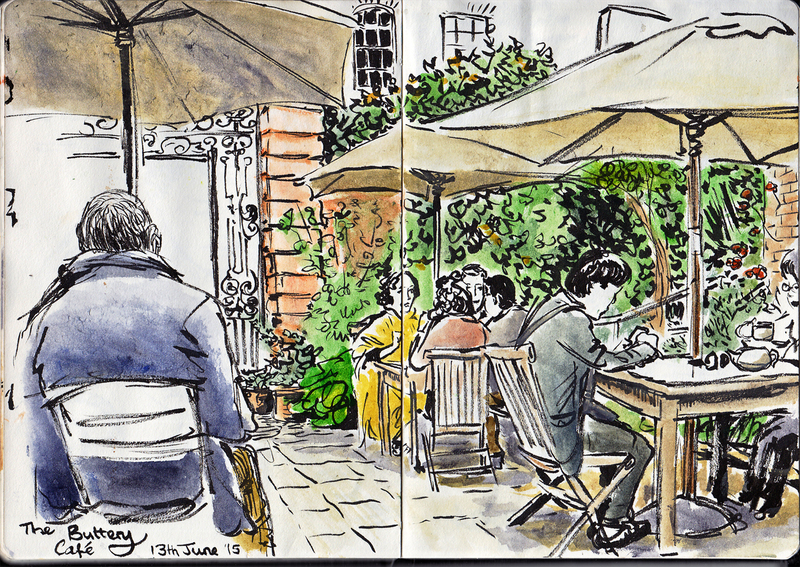 On Saturday we had our now monthly sketchcrawl; June's location was Hampstead, North London! Thanks to everyone who came - with each event now I seem to meet more and more new people joining us for the first or second time, which is great - apologies if I didn't get chance to speak to you all, but I hope everyone had fun. 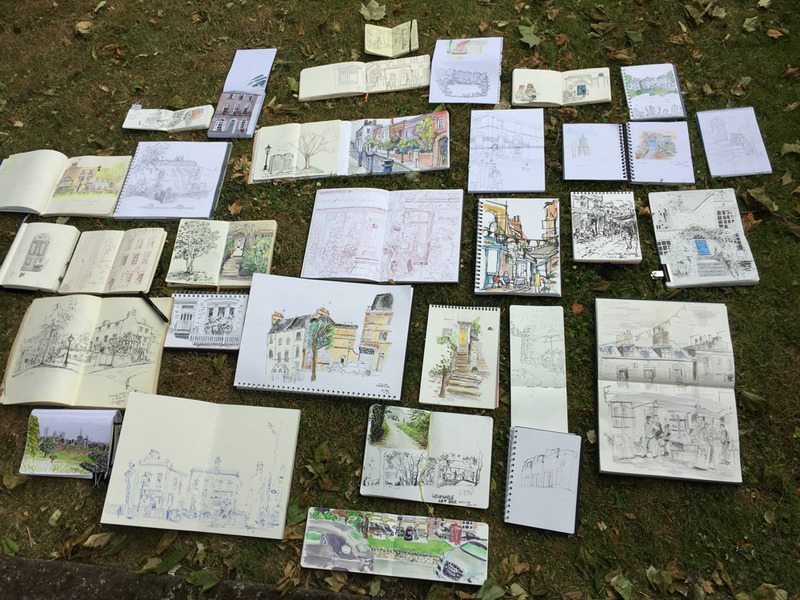 Please upload your sketches to our group on Flickr if you want to - it's always inspiring to see everyone's different styles and interpretations. It was a somewhat grey, chilly start to the day, but the rain just about held off, and by the end there was even some sun. I ended up getting an early tea at our lunch spot - the Buttery café, and staying there to finish my drawing. 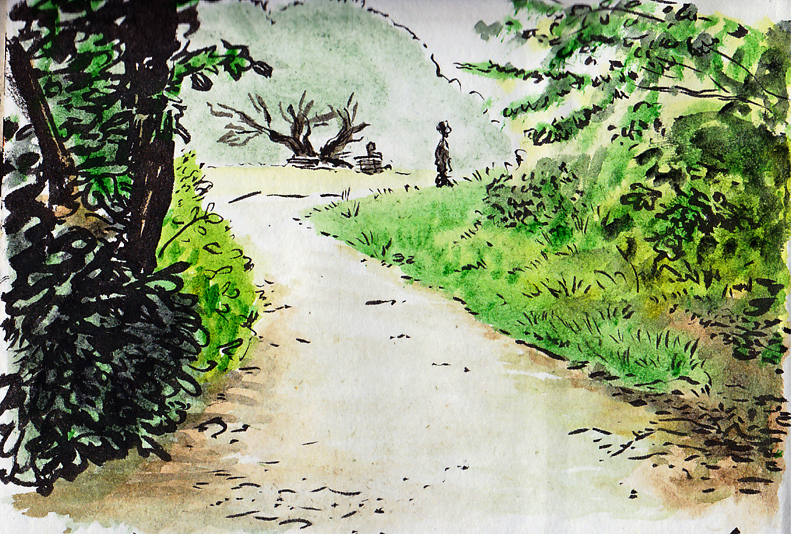 After warming up inside and seeing something of what others had been drawing, I headed off to see a bit of the heath. Hampstead is a beautiful area, not only the heath (the most famous reason for going) but the neighbourhood itself - although it doesn't feel quite so rural and far removed from London as it did in Constable's and Keats' time, it still retains something of the peaceful village atmosphere, with its genteel houses, cobbled streets and abundant greenery. So it was nice to spend time walking around admiring the streets that normally I only have time to rush along going from A to B. Perhaps I did too much admiring and not enough drawing, as I only got 3 sketches done, but that's the problem - there's a lot to take in. On my way back from the heath, I came across Daphne Du Maurier's house, which I'll have to come back and sketch another time, as I spent too much time looking at the Affordable Art Fair (which cost a rather unaffordable £15 to go in), and all too quickly it was time to get back for the finish. Thanks to all of you that attended, and I hope to see you again soon! The next sketchcrawl will be a summer holiday! 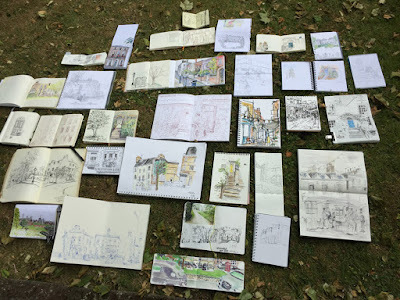 - a daytrip to Oxford, for anyone that fancies it, we'll be joining forces with the urban sketchers of Oxford as the finale of their annual workshop - keep an eye on the blog for a post from Isabel with further information; briefly - Saturday July 11th, 11am outside the Museum of Oxford. It's free to take part, as ever, but you will have to make your own way there and back I'm afraid - trains run regularly from Paddington, and there's also the "Oxford tube" coach service running from Marble Arch. Not the most inspiring title I know but it is true. After two visits to Waitrose in South Woodford, I had justified two large blue milk lattes and a chocolate torsade. This is the little group of higgledy piggledy buildings on view from the new 'bar' area by the check outs. Much nicer to be able to set up shop, sitting down.